First and formost hotel in the Mathura, has an established patronge, to the executive in the town on business,devotees visiting Lord Krishnas Janam Bhoomi or Vrindavans historic temples packed with ancient art. Gardens, Business Facilities, Backup Generator, Internet/Wi-Fi, Doctor on Call, Parking, Room Service, Airport Transportation, Conference Hall, Breakfast Services. DVD Player, Cable/Satellite TV, Attached Bathroom, Wakeup Calls, H/C Water, Desk, Air Conditioning Room, Television Room. 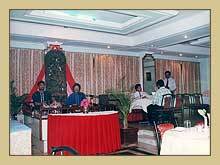 User reviews for "Madhuvan Hotel Mathura"